The Heart and Stroke Foundation of Canada5 recommends at least thirty minutes of moderate-intensity aerobic activity–such as brisk walking or bike riding–at least five days out of the week. If you work Monday to Friday, consider adding a few steps to your commute, or taking two 15 minute walk breaks each workday. Create a schedule to remind you to stand up and move. Programming your day can help you stick to something you may otherwise forget to do. A good goal is 5-10 minutes of activity per hour. 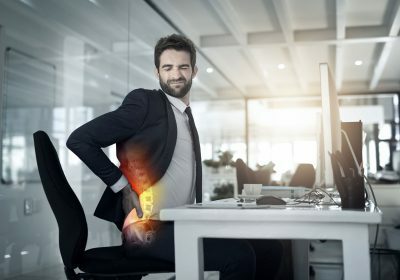 For example, if you have a job that involves sitting most of the day, plan to spend five minutes every hour up from your chair and moving around the office (like getting coffee, walking around the building, or taking a restroom break) and spend the other five minutes doing stretches. Little changes can go a long way to improve your posture and decrease a number of health risks. Whatever method you choose, you can also use the Straighten Up Canada app and Fit-in 15 program to find small exercises you can do during the day. Of course, regular check ups with your chiropractic at Pacific Chiropractic can help reduce the chances of stiffness, misalignments or even nerve pressure from building up…at least, that’s what our patients tell us! Posted in Articles and tagged back pain, Chiropractic, computer set up, Low Back Pain, massage therapy, neck strain, poor posture, training, work breaks, Yaletown Chiropractor, yaletown clinic by The Back Doc.